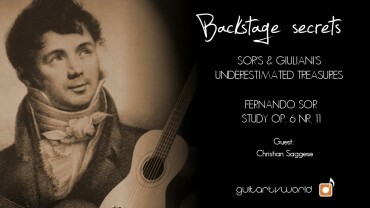 „The underestimated treasures of Mauro Giuliani and Fernando Sor“: this is the subject being examined by Italian guitarist Christian Saggese for the Guitar TV World series called „Backstage Secrets“. 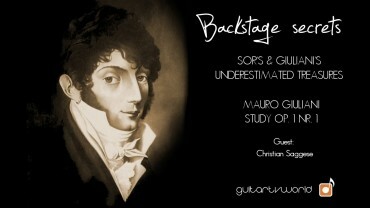 Saggese promotes the beauty and musical value of these apparently simple and often undervalued studies by Mauro Giuliani and Fernando Sor through a selection of ten studies in total. Thanks to his impeccable technique and his outstandingly sensitive interpretations, Christian Saggese offers us a new perspective on these jewels of the Classic-Romantic period, and he invites us to rediscover them through his serious and profound study, as actual concert pieces. This series consists of ten brief video productions in total, of which five are studies of Mauro Giuliani and five are of Fernando Sor. Christian will not only show us his masterful interpretations of the works, but he will also give us tips on studying these musical pages.